Hey folks-we’re still rolling along. The theme of yesterday was wet. It pretty much rained the whole day. Luckily, it didn’t really seem that cold. It really only became a bummer when we got slightly lost on dirt roads (thanks google maps). Today, on the other hand, was gorgeous. Clear and sunny. It felt like we were riding through the opening of Newhart – one quaint new England farm or town after another. unfortunately, we were once again deceived by google, which doesn’t seem to know the difference between roads and snowmobile trails. We had to push our bikes over crazy terrain (rocks, ditches, bogs) for about an hour. We may need to call Jamie and Petra for a pickup, since we have fallen behind schedule in true bum fashion. Alright! We made it to Plainfield. We had a awesome ride on Friday – we ditch-camped next to a bike path, began the day with a series of breakfasts as we waited for the rain to clear up. Quote from the local banter at the cafe: “Waitress, I need a refill on my coffee!” “Hold on, I’m watching this commercial about the new model of my vacuum cleaner!” We ended up on yet another dirt road, but it turned out to be essentially our own giant bike path through the forest – pretty awesome. 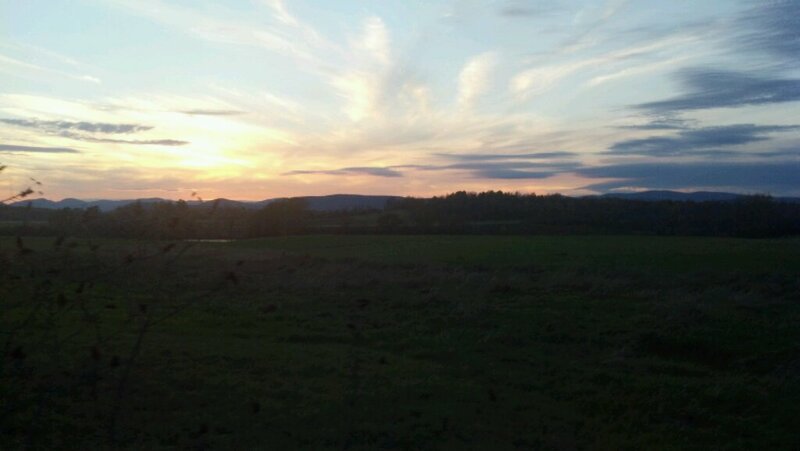 We then popped out into the Connecticut river valley – amazing! Pretty easy rolling terrain, low traffic, and gorgeous scenery. A bit chilly – low forties – and at a couple of points we got some snow flurries. Jamie picked us up just as the sun was setting. Jamie and Petra’s place is pretty amazing – their house resembles a treehouse, and they have a spectacular view across the valley. Yesterday we checked out the Bread and Puppet museum, which was pretty amazing. We also went to the rehearsal of their new band, the “Stone Wall Band” and went ver some BLO tunes with them. Plainfield, and the surrounding Northeast Kingdom region, seems wholly populated with wonderful freaks. 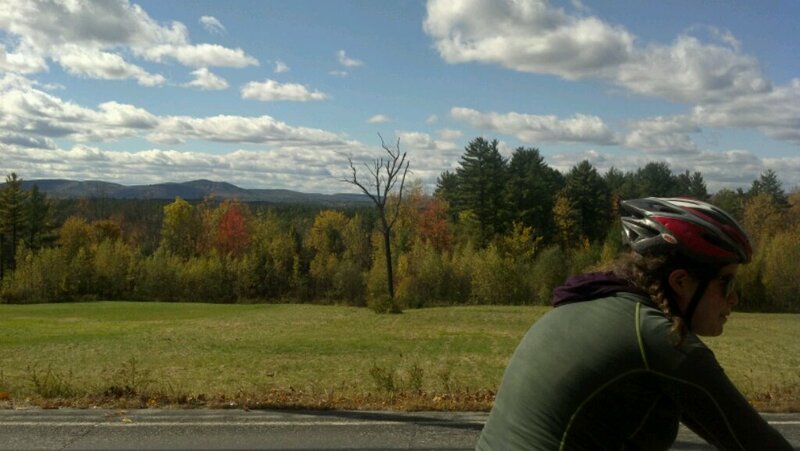 A few words about routing through the Northeast: I’m used to figuring out bike routes in the west, where there is usually only one or two possible ways to get from point A to point B, and most of the roads follow the terrain. Here, there seem to be lots of different ways to get anywhere – a number of times when we’ve asked directions, we’ve gotten long descriptions of all the possibilities, which essentially amounts to no information at all. Also, it seems that most of the roads were primarily planned out by farmer Smith’s cow taking a particular route between the barn and the field, with little regard to the terrain. Also, the roads seem to randomly loose their pavement, or deteriorate into ATV trails. But it all adds to the adventure! Tomorrow I’ll be heading west to Burlington, to visit a bike touring buddy, Shannon, and hopefully Noah and Kelly. Alas, Sarah just left with her friend Jen to head to the White mountains in search of moose to ride, so I am now riding solo. OK – enough drivel: pictures! 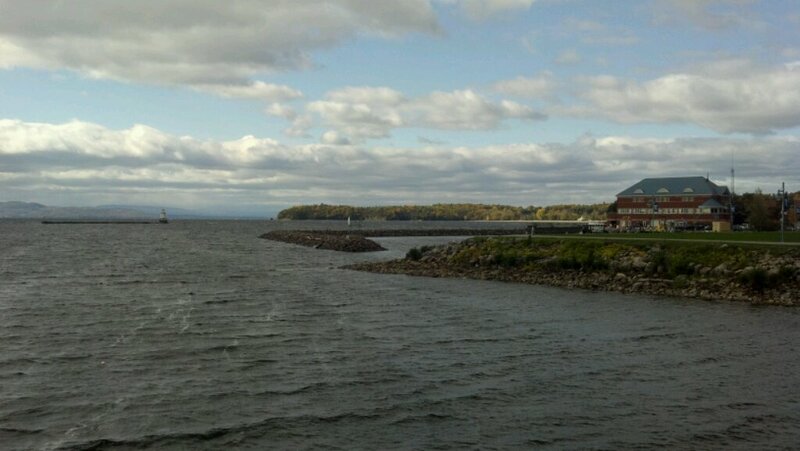 Author gregPosted on October 14, 2012 Plainfield, Vermont1 Comment on Plainfield! Ok..quick update before phone dies. Awesome ride from plainfield to Burlington along Winooski river. Met up with the wonderful Everitt-O’Malleys. Highlights included homebrew, great Danes, and a toxic garden. 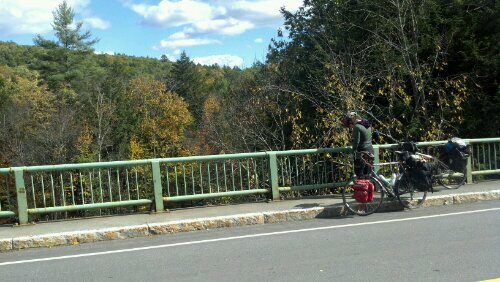 Also hung out with fellow bike traveler Shannon, who escorted me out of town on an amazing sunny day. Today managed to put in 73 miles on another great, warm, sunshine filled day through beautiful countryside. Slight setbacks include me having grabbed the wrong pile of maps for this trip, my new tent already festooned with pink mold spots, and the rains returning tomorrow (but at least not too cold!). Wish you were here! 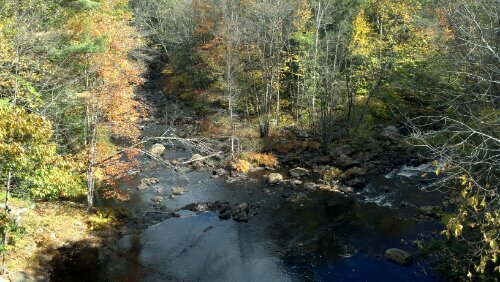 Author gregPosted on October 18, 2012 Ballston Lake, New YorkLeave a comment on New York! My ride on Friday was pretty much like riding through the middle of a lake – it was pouring buckets for a good part of the day. In fact, it rained so much it killed my speedometer, and caused my headlight to get stuck on. I shudder to think how many extra pounds of water weight I was carrying due to soaked gear. I did, however, join up with the Erie Canal trail, despite several run-ins with terrible 1970’s urban planning (“hey! let’s make everything a freeway!”). I ended up camping at a town marina, which offered laundey, free hot showers, and an endless supply of slugs to crawl over my tent and gear. Saturday morning, I started the day at Grandma’s restaurant, home of the $2.35 hash browns, eggs and coffee breakfast, as well as some fascinating local chit-chat regarding the Masonic Order. The weather cleared up and I merrily rolled my way through the picturesque Mohawk river valley. I stopped for lunch at a picnic table in a sunny clearing, overlooking a ravine filled with trees awash in autumn colors, and I realized I wasn’t having any fun. It wasn’t the weather, or the terrain – it was a combination of the short days, the difficult pace I had set for myself, and most of all, the fact that I was by myself. The riding was enjoyable, but it’s really not nearly as much fun when there’s no one to share it with. i still had nearly 500 miles left to travel, or 8 days at the 60 mile per day pace i had set for myself. 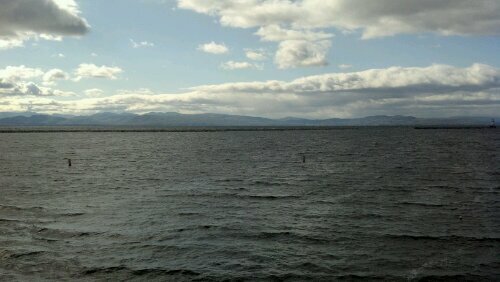 To get 60 miles in when there’s only about 10 hours or daylight means you are pretty much just slogging along all day. 9 more days seemed daunting, and I’m anxious to get back to Oakland. So, I pulled out my phone, verified I could change my flight for free, and checked the Amtrak schedule for Syracuse to Cleveland. I spent the next 10 miles mulling it over in my mind, and I decided that I would try to make the train that night – if I made it, I would take the train, if not, I would continue riding to Pennsylvania. I had about 3.5 hours to ride 37 miles. Thus began a wild drive that rivaled 2009’s Kelso sprint. Challenges included a nasty headwind, a brief but stinging rain, and the fact that half the ride was in pitch black. Additionally, I didn’t have time to stop and eat, so the whole thing was fueled solely on handfuls of Reed’s crystallized ginger candies. I kinda wish I had a recording of the insane drivel that I was saying to myself towards the end as I rushed to try and keep my pace above 11 mph (further complicated by the fact that I no longer had a working cycle computer). The most difficult part was the gauntlet of crappy restaurants on the edge of town, luring me to halt my task with wafts of greasy deep-fried bliss. In the end, I made it, clocking in a 92 mile day. I rolled my bike into a spacious Amtrak-issued box, packed up my biking sandals, and hours later, was at the foot of the Rock and Roll Hall of Fame at 4am, waiting for my brother to pick my up. So, not the most ceremonious end to a bikebums trip, but perhaps the most bumly. I’m now hanging out at my mom’s house, and I don;t really regret the decision – I had a great time for the part of the trip I did go on, and the Grand Canyon of Pennsylvania will always be there, waiting for me. In the end, I rode about 525 miles – add that to June’s trip and that’s 1,915 – not too shabby. Since people often ask, it appears that I’ve now logged 26,094 miles of long-distance loaded touring, with nearly 20,000 miles on trusty Tatonka. Not bad for a bum. We are we going next! ?